An Iraqi man passes by a boat resting on the dry and cracked ground in the Chibayish marshes, near the Iraqi city of Nasiriyah, in 2015. Iraqi people drew attention to the lack of infrastructure and corruption among government officials as the main sources of the current electricity and water crisis that is devastating the country, rejecting some media reports suggesting that Ankara's water policies are aggravating the problem. Iraq is facing one of the most serious water shortages in decades. The drought that specifically hit the Shiite-majority southern provinces has brought the region to the verge of a humanitarian crisis. Yet, drought is not the only concern of Iraqi people and government nowadays. Mass anti-government protests erupted in Basra due to electricity cuts in mid-July and spread to other southern provinces, and eventually to the capital Baghdad. During the protests that caused the deaths of dozens of people, many official buildings were besieged and stormed, and even torched in some cases by angry protesters. "Demonstrators want the government to provide jobs as well as rehabilitate and build the infrastructure of electricity and water. They also demand the end of corruption and some are even seeking to change the regime," Rabee Sagban, 34, a freelance worker living in Kut city in the southern Wasit governorate, told Daily Sabah. The protesters, who poured into the streets in extreme temperatures reaching 50 degrees Celsius in some of the southern provinces, were weary of wasting the resources of their oil-rich country. Their demand was simple: getting clean water, electricity and basic services. However, failing to respond to its people's demands, the Iraqi government arrested hundreds of protesters and found a scapegoat for their failure: Its northern neighbor, Turkey. According to Ayas Salah, 37, a high school art teacher living in Baghdad, the main source for the crisis is poor infrastructure, "which hasn't been properly developed for a long time." "Three years ago, we poured into the streets with the same demands here. That was about basic needs, particularly about electricity cuts, but politicians politicized it, and nothing has changed so far. Iraqi politicians simply are not capable of devising a future for the Iraqi people," Salah told Daily Sabah. During and after the protests in Basra, the Iraqi government pointed to dams which are being built in Turkey's border provinces, and specifically accused the country of polluting its waters, decreasing its water quality and drying up the Arab marshes in the southern part of the country. Speaking to Daily Sabah, Turkey's ambassador to Baghdad, Fatih Yıldız, said that the necessary investments have been neglected in Iraq in infrastructure, including water for a long time. "Therefore, it is unfair to show Turkey as the reason behind the whole water problem," Yıldız said, adding that this is also acknowledged by the people of Iraq, as well as officials including governors. He added that it was a difficult year for both Iraq and Turkey which experienced its driest year in the last 44 years. The claims of the Iraqi government have been embraced by some local and international media outlets. In a short period of time, it has also turned into a misinformation campaign on social media against Turkey, with the participation of some politicians. Despite the accusations by some people on social media, the Iraqi public point to the country's grave problems which have long been disregarded. "I don't know about the difference between the amount of water we already receive from rivers coming from Iran and Turkey and the amount we should receive. But I know very well that our governments have made a significant omission on the water issue since the time of Saddam [Hussein]," said Hussam Hamza, 33, a translator who lived for three years in Badra, a town facing water issues in eastern Iraq in the Wasit governorate, before he moved Baghdad. Experts and reports also are suggesting that the problem does not lie in Turkey's dam projects, rather they are more deep-rooted. Haidar Abadi, the head of the general union of farmers association in Iraq, told Daily Sabah that the roots of recent agricultural problems of Iraq date back to the 13-year embargo imposed on the country in the '90s after the invasion of Kuwait. Haidar Abadi, the head of the General Union of Farmers Association in Iraq. "We couldn't improve ourselves on the modern methods used in irrigation and lagged behind the modern world," he said. The sanctions against Iraq were imposed by the U.N. Security Council in 1990 and stayed largely put until the overthrow of Saddam Hussein in 2003. The embargo triggered high rates of malnutrition, a lack of medical supplies and diseases from lack of clean water in the country. 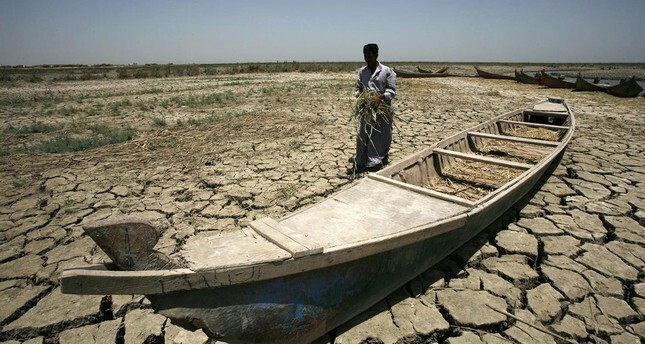 Another problem which dates back to the Saddam Hussein era is the drying of the Arab marshes. During the 1991 uprising, Iraqi strongman opened large canals to punish the Shiite population and the Madan people, living in the south and east of Iraq. Saddam cleared these marshes to gain tactical advantages during the Iran-Iraq war. Later in 1985 a part of the marshes was also drained for oil exploration. Moreover, a report published by the Save the Tigris and Marshes Campaign in February 2018 puts forward that the rate of pollution has increased in the past decade, especially from industrial and household discharges dumped into the Tigris River in Baghdad, the capital of Iraq and the administrative, industrial and population center of the country. Particularly the Medical City and the Daura Refinery are identified as the main causes of pollution in the river. Abadi also drew attention to the "serious drought" that hit the country this year, adding that global warming aggravated the problem in recent years and effected the harvest season. The Iraqi government often complains about the Ilısu Dam on the border between Turkey's southeastern Mardin and Şırnak provinces as one of the reasons of a decreasing flow of water to the country. Desiccated land near the highway that connects southern Iraq's Amara and Kut, two of the cities hit worst by the recent drought. The construction of the dam began in 2006 with the aim of utilizing the Tigris' resources as part of the $32 billion Southeast Anatolian Project (GAP) launched in 1977, one of the world's largest and most comprehensive sustainable development projects that includes efficient irrigation methods and a water infrastructure development scheme. The process for filling Ilısu Dam was planned to begin on June, but it was postponed to July 1 due to a heat wave in Iraq. Turkey had assured the Iraqi government that the flow will continue as much as they need. Turkey's ambassador to Baghdad, Fatih Yıldız (L), with Daily Sabah Ankara correspondent Özgenur Sevinç. Turkish Ambassador Yıldız underlined that Turkey is not a water-rich country, yet it is able to understand the relative needs of its neighbor country. "Thus, we act in line with the consciousness that Iraq needs more water than us. Actually, the Ilısu Dam was going to function this year. Considering the needs of Iraq, Turkey has postponed this twice to July 1," he said. Speaking to Daily Sabah on the conditions of anonymity, Turkish diplomatic sources also said that there were serious claims that the Iraqi government was keeping water in the Mosul Dam "as a possible attempt to pin the water issue on Ankara." Turkey closely cooperated with the Iraqi government during the building process of the Ilısu Dam and kept open high-level dialogue channels. Political and technical contacts and consultations were conducted between the two countries. While Turkey's former Forestry and Water Affairs Minister Veysel Eroğlu met with Iraq's Water Resources Minister Hassan al-Janabi, four times last year, a technical committee from Iraq visited the dam in December 2017. Meanwhile, Abadi drew attention to the manipulation attempts against Turkey in the Iraqi media. Sagban, an Iraqi local, said that their government is mainly responsible for the water issue and it should think about methods to solve the problem. Yet, he also blamed Iran and Turkey for their water shortages, saying the countries "used our weakness and gave no attention to neighbor principles." The Iraqi governors of southern provinces called to find an urgent solution to the water shortage, warning that the issue would possibly turn into a complete humanitarian catastrophe if it is postponed. "Indeed, we are experiencing a serious water crisis. Not just irrigation water but also drinkable water. There are villages we couldn't provide water for years and they are now empty," Mahmoud Abdul Ridha, governor of Wasit province, told Daily Sabah. Mahmoud Abdul Ridha (L), governor of Wasit, spoke to Daily Sabah. Wasit is one of the southern provinces of Iraq that has been seriously affected by the water crisis along with Basra, Dhi Qar, Diyala and Maysan. Agriculture is the main income of the locals. However, this year, the governorate could only provide water to 700,000 acres out of the 1.4 million acres total agriculture area of the governorate. The amount of water delivered, especially to the villages far away from water sources, has significantly decreased due to low water levels. Reportedly, the sprinkler water system in these regions couldn't function properly due to insufficient water. Abdul Ridha reproached Iraq's Water Resources Minister Hassan al-Janabi and ministry officials for not defending the Iraqi people's interests on water issues or reaching an agreement for the common use of water with neighboring states. "I accept that water was wasted in some cases in Iraq. But I think we are not receiving enough water from our neighbors, particularly Turkey," he said. He also requested that the Turkish government allocate water specifically for the Wasit governorate, apart from the water released to Iraq. Some projects, including the establishment of poultry farms, fishing and opening new water channels, were temporarily halted with the instruction of Ministry of Water Resources and the Ministry of Agriculture. Ambassador Yıldız underscored that Turkey will fund Iraq with $5 billion in the following period for rebuilding projects and its know-how in water management. He added that water is an issue of cooperation and it should never be an issue of conflict between Iraq and Turkey. Turkey pledged $5 billion in loans and investment for Iraq earmarked for the reconstruction of the country, making the country one of the top contributors at the international donors' conference held in Kuwait City in February. The governor of southeastern Iraq's Maysan province Ali Dawai (R) with Daily Sabah's Mustafa Kırıkçıoğlu. Ali Dawai, governor of Iraq's southeastern Maysan province and seen as a possible prime ministerial candidate in the next Cabinet, told Daily Sabah that the they have failed to plant certain agricultural products, including rice, for many years due to widespread drought, which could possibly trigger a wave of migration to big cities. The main areas of water usage in Maysan are agriculture, industry (specifically in oil wells), potable water, sugar plants and tourism, as the governorate keeps the water level in southern marshes at a certain level for tourist purposes. The marshes or network of waterways in Maysan, which are located near the Iranian border, were declared a UNESCO World Heritage site last year. They are known for their natural diversity and located on the migratory path for thousands of birds. Dawai said the problems in Middle East, including the water issue, which has started to turn into a catastrophe, should be solved by an initiative of regional countries that have strong historical bonds. "Turkey and Iraq should increase cooperation to find common ground on the water issue," the Maysan governor said. The need for water should be scientifically assessed. Iraq already has the right to use 58 percent of the 500 cubic meters of water per second flowing in the Euphrates set aside by Turkey for Syria. The Iraqi government is trying to gain similar leverage on the Tigris. Contrary to popular claims, Turkey is not a water-rich country. In water-rich countries, the amount of water per capita is approximately 5,000 cubic meters, while in Turkey was around 1,500 cubic meters. It is estimated that this number will decrease to around 1,125 cubic meters in 2030 due to climate change. Sixty percent of the Tigris is located on Iraqi soil. Streams draining out of the Tigris in Iraq consist of 31 billion cubic meters of the total 52 billion cubic meters of water reserve for the river. Turkey has nothing to do with this issue. Iraq's drainage policy in the 1990s created today's situation. An agreement over the percentages of water share should be immediately reached. Turkey has many sources of water, including rain and snow; however, Iraq's climate is dry and as a result, it needs more water flowing into it from the region. Agriculture is the main source of livelihood for a significant part of the population. If they cannot irrigate their land, migration will increase, affecting Turkey negatively. The southern marshes face the risk of drying up as a result of Turkey not releasing sufficient amounts of water. The activities of Iran and Syria as well as Saddam Hussein's incorrect policies in 1990s have played a role in the end result today. Agriculture and food security would be at risk without dams. Building dams in Turkey also benefits Iraq as evaporation rates drop due to narrow valleys. The World Commission on Dams published such a report, but it was deemed an unreliable source when criticism of it was taken into consideration. In addition, the Euphrates and Tigris rivers are not suitable for building small dams. Food security could be established without dams. The era of huge dams is already past as their deficiencies have been proven. Dams and joint dams should be discussed by the same committees. The real purpose of the Iraqi government forming a separate committees is to discuss the existence and future of Ilısu Dam and delay the joint dams issue. This is why they act slowly on the issue. These are separate issues and should be handled by different committees. The Ilısu Dam was built to produce hydroelectricity, not irrigation; therefore, it will not cause a decrease in water flow. The information about Ilısu Dam has been provided to Iraq. If the Iraqi side provides information and data on their water usage, better cooperation can be established. Water holding in Ilısu Dam should be planned in a way that will not harm Iraq. The Iraqi government should be informed six months before water holding commences.